I had a mini facial the other week at Kiehls and they gave me a step by step skincare routine that they would recommend. This really got me thinking about my own routine and how I would add in some extra elements or try to do it a little differently. I know this sounds really lazy but I simply don't have the time or patience to have a seven step skincare routine before and after I have been to bed. The one thing that I was really interested in trying was serums. I have had a few samples in the past but haven't actually used one as part of my routine. I was really impressed with the KiehlsHydro-Plumping Re-Texturising Serum and how quickly this soaked into my skin and didn't leave my face feeling sticky or greasy. This brand is a little pricey for a product I am unsure as to whether I will adopt as part of my routine or not. Before I was going splash the cash on a serum, I decided to look at different brands which are a little friendlier on your purse. 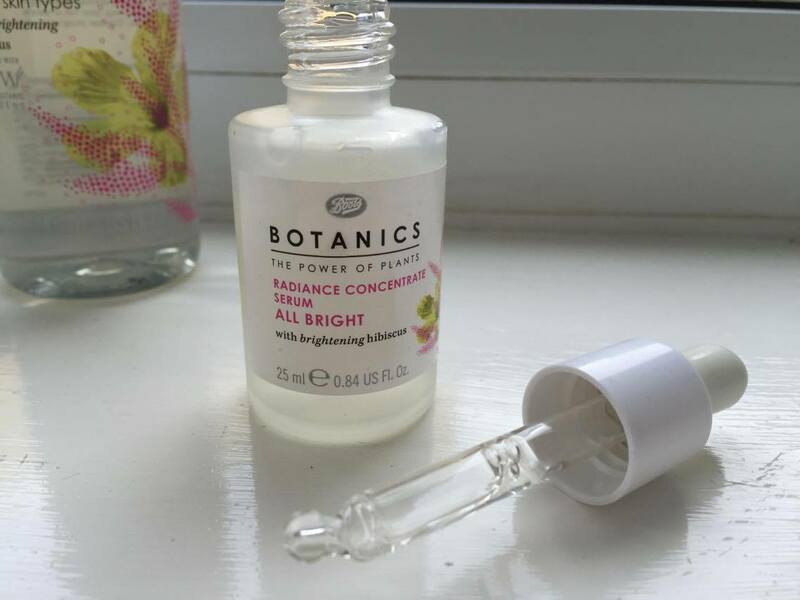 The one that I did buy this week was the Botanics All Bright Radiance Concentrate Serum. A range which I haven't tried before so I was interested to see how it would go. At £6.99 you can't really go wrong for a trial really. After using this serum for a few weeks now, I have found this has slotted into my routine really easily. I use the serum just after my toner in the morning and each evening. This one does take a few minutes to dry properly on my skin, so a little longer when compared to the Kiehls serum but I feel it does bring some hydration into my skin. It has also helped the dark patches I sometimes get under my eyes and has given me back a healthy glow. It may be the case that this healthy glow and a reduction in dark patches has been due to being more strict with myself on my skincare routine, but either way something has worked well so I am going to carry on with it for the foreseeable. Last week I also managed to pick up the Botanics Micellar 3 in 1 Cleaning Solution All Bright. I was frugal and got this as part of an O2 Priorities promotion. I tend to use Micellar waters as toners so after I have cleansed. I love toner waters , they are big part of my usual skincare routine, particularly before and after the gym, and when I have removed my make-up. I really enjoy the fresh feeling that they leave you with, I like products where you can instantly feel the results. I have only been using this newly re-jigged routine for just over a week so it's a little difficult to do a full review on, but favourable first impressions mean that I am going to continue using them. It doesn't leave any residue behind and clears away any makeup that my cleanser may have missed. The bottle is a screw top so handy if you are using it on the go or are traveling, as it is less likely to spill or leak everywhere. However, I do usually prefer a squirt bottle top so I can spray it all over my face, refreshing for when I am hot during the night or just before bed. 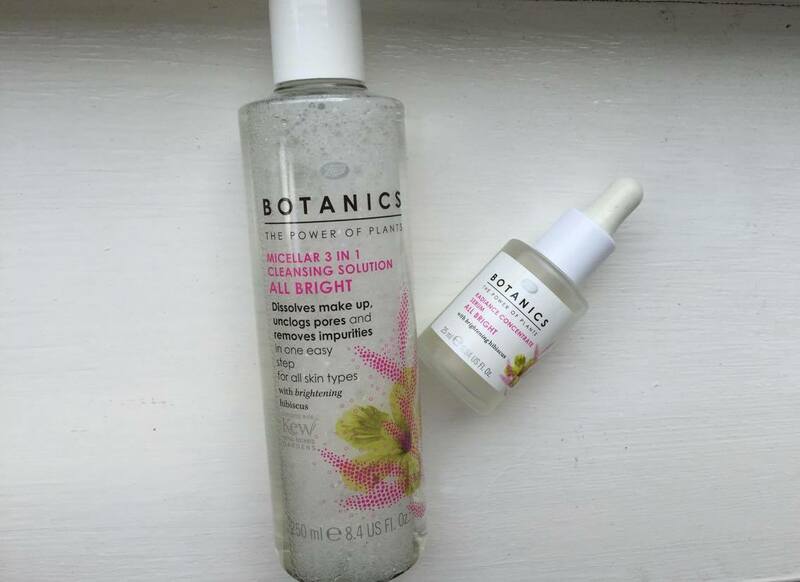 I think these two brightening products from Botanics are a great pair for the summer months and if you're wanting to help bring some life or energy back into your skin.